Jose Froilan Gonzalez was an imposing figure both as a driver and a physical presence. To the modern eye it seems inconceivable someone with the built of a wrestler could be a successful driver - his short and stocky physique topped by a chubby face earned him the nickname the Pampas Bull - but in an era where strength was as valuable an asset as guile, Gonzalez was one of the leading competitors. He was also a good all-round sportsman. Gonzalez, the son of a car dealer in Arrecifes, was widely regarded at the time as one of the most proficient drivers, but he is largely overlooked because of the achievements of his fellow countryman Juan Manuel Fangio. Like many of his contemporaries, he switched teams with regularity but often with less success. After being set up in business by his father in 1949, he was able to travel to Europe to race. He made his Formula One debut in the 1950 Monaco Grand Prix, racing a Maserati for the Scuderia Argentina team in place of Fangio who had crossed over to Alfa Romeo. His luck changed in 1951 when he joined Ferrari and he managed podium finishes in all five grands prix he entered for the team in 1951 with victory at the British Grand Prix - it was also Ferrari's maiden championship win. The Times described both Gonzalez and Fangio, who waged an epic battle at Silverstone, as "absolute masters". 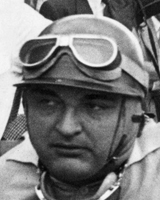 In 1952 he again moved, this time to Maserati, and while he was competitive he did not manage wins in the two seasons he remained with the team. A return to Ferrari in 1954 brought another victory at the British Grand Prix (on the same day he also won separate 35-lap and sports car races) followed by a brace of seconds in Germany and Switzerland, and he ended the year second to Fangio in the drivers' championship. He also won the Le Mans 24-Hours partnered by Maurice Trintigant. But he missed the end of the season after crashing practising for a race in Northern Ireland, and returned to Argentina to look after his garage business. He continued to enter the Argentine Grand Prix - he came second in 1955 and fifth in 1957 - before bowing out altogether in 1960. He only appeared once more in Europe, but his guest drive in a Vanwall at the 1956 British Grand Prix ended with a driveshaft failure on the start line.